What happens to your skin during menstruation and the weeks leading up to it? Do you suffer from hormonal breakouts too? If so, this post is for you. I have to admit, even though I have a pretty awesome skincare routine down, I STILL struggle with hormonal breakouts, although they’ve lessened so much in size and intensity. Part of that is due to hormonal imbalance, which I’ve treated with bio-identical hormone replacement. But each person is unique, just like each skin type. So please take this post with a grain of salt. If you’re not seeing results from your skincare, you might want to explore other avenues as well, such as medical assistance, dietary improvement, hormone therapy, etc. We are holistic beings and I believe that treating the skin requires a holistic approach as well. That said, here are some tips & tricks to get you through your time of the month, every month. I have to thank both Knours & Blume for inspiring me to write this post! 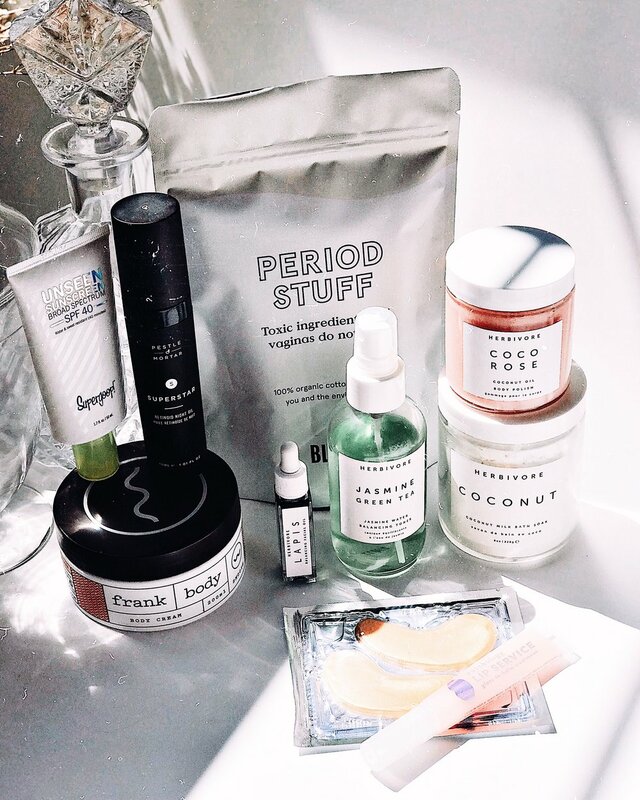 These are two brands I’ve collaborated with in the past, and their entire skincare ranges are built upon the idea of period care. Knours is more skincare focused & Blume is more bodycare focused, but both are amazing, ethical brands well worth supporting. Knours has a skincare line specifically formulated to function around a woman’s hormonal cycle. They even have an app to track your cycle. It combines skincare & menstrual care, and gives you product suggestions depending on how your skin is changing throughout the month! I absolutely love this innovative app, it’s a great way to track my period AND geek out on my skincare passion at the same time. I highly recommend it! When it comes to my time of the month, my skin is often feeling extra stripped & sensitive. It’s super important to use a gentle, hydrating cleanser during this time of the month (though you should really be prioritizing gentle products at all times!). I have 2 different cleansers I’d recommend. Option 1. Day Dreamer facial cleanser by Blume – this is very gentle & creamy, and perfect for dry or sensitive skin. Even if you're on the oily side of things, this makes a wonderful first cleanse. It's creamy, dissolves makeup, and doesn't leave you skin feeling stripped or tight. During menstruation this is especially important as even oily skin can get severely dehydrated due to hormonal fluctuations. Another positive here is the price point, it's super affordable! Is this the best cleanser I've ever used? No, but for the price point it's great. And even though I like other cleaners as well, they tend to have actives in them which I think is too much for my skin during my period. When my skin issues flare up, I like to keep things simple, and this cleanser is perfect for that! I love the short ingredient list & the creamy, moisturizing nature of the product. Option 2. Cleansing Sticks by Bliss - these are SO easy to use. If you’re on your period and you’re exhausted, the last thing you’ll want to do is a complicated 10 step routine. Bliss cuts the cleansing time in half or less by letting you apply these sticks straight onto your face. All you have to do is add water, and rinse! My favorite cleansing stick is the cold pressed olive oil foaming cleanser. It can take off makeup and grime, but it also foams up afterwards, so you don’t need to double cleanse if you don't want to (although I always do). The only issue with these sticks is cleaning them after use. I don't wear makeup on the daily so it's easier for me, but I feel like the makeup will just collect on the bottle itself and cause issues. There are a lot of great toners out there, and I usually prefer using a hydrating one. However during my time of the month, I sometimes need something a bit more balancing for my skin, especially when I’m fighting an active breakout. Herbivore’s jasmine green tea toner is perfect for that! It balances oil production, prevents breakouts (including treating hormonal ones), balances the skin, and has multiple anti-inflammatory benefits. The sprayer mechanism is pretty good too, which is always important to me. PS - if you want 20% off your herbivore order, use THIS LINK. All you have to do is sign up with a new email each time & you'll get 20% off! Masking is always one of my favorite nightly rituals and during my period, it’s extra important. I like to double up with an eye mask and Herbivore’s blue tansy mask, which anti-inflammatory in nature and helps soothe irritated skin. You can use it for breakouts, redness, eczema, puffiness, swelling, texture, you name it! It’s really an all-in-one type of product. Since my under-eyes are usually worse off during my period, I like to pair the blue tansy mask with an eye mask, especially one that will deal with black circles & puffiness. Pictured here are ones from Beaute Hacks - you could use any eye gel that has retinol, caffeine, and hylauronic acid in it. My other go-to’s are from Patchology (dark circles & wrinkles), Elemis (puffiness), and Viicode (hydration). You can choose one based on your unique eye needs! Water based serums are wonderful, easy to layer, and perfect for getting actives into the skin. I like to use both a water based serum and an emulsion during my menstrual week. The water based serum absorbs quickly, and the emulsion acts as a second layer, providing both water AND oil soluble nutrients for the skin. 1. The water based serum I would recommend is Beauty Bio’s the Daily serum which is packed with vitamin c! The derivative they use, MAP, is much less irritating than ascorbic acid and much less likely to cause reactions. When you’re dealing with hormonal breakouts, that’s of the utmost importance! This serum also has peppermint which soothes active pimples & helps to reduce the chances of bacteria getting trapped under the skin. This has become one of my favorite water based serums of all time! It absorbs quickly, works within a few days, and really helps to brighten up the skin. 2. The emulsion I’d recommend following up with is Dr Roebucks Surf Chaser Age Reversing Serum or their Perky Collagen Boosting serum. They’re both really similar and both worth every penny. It’s rare for me to recommend a product that is over $60 but believe me when I say these are magic. The age reversing serum has vitamin c, hyaluronic acid, retinol, amind acids, peptides, niacinamide, squalene, etc. The collagen serum has niacinamide, retinol, hyaluronic acid, rosehip extract, ginseng, amino acids, borage oil, squalane, vitamin e, etc. They both feel AMAZING on my skin, super hydrating AND moisturizing. Perfect for repairing a damaged moisture barrier and truly the only serums you’ll need in your arsenal. These do everything, an “all-in-one” type of product. When you look at the ingredient list (especially considering how high up retinol is in the formula), you’ll realize these are a total steal! Although all of the skincare products I’ve recommended so far should help to reduce the chance of breakouts, sometimes you need an extra something to deal with an active pimple! Enter – spot treatments! These are great because you don’t have to use them all over your face, simply apply a drop or two to the area of irritation or the pimple itself. 1. Herbivore Botanical’s lapis oil. This is a well-known and well-loved facial oil in the skincare community. The level of blue tansy they included is unreal, you can tell by the deep blue color. Blue tansy is a great ingredient for breakouts, it curbs inflammation, has anti-bacterial properties, and soothes the skin – all while promoting healing and increased cellular turnover. Sounds great, right? (If you want 20% off any herbivore order, you can use this link). It DOES get quite expensive as a facial oil so I do reserve it for spot treatments only. I recommend getting the True Blue kit, it’s a cheaper way of trying out the lapis oil, and the little 4ml bottle should last you forever if you use it as a spot treatment! 2. Blume Meltdown blemish treatment. This is a much more affordable spot treatment, at only $26 for 15ml! It stinks to high heaven due to the black cumin oil but it’s so worth it, believe me! This stuff works immediately. Definitely quicker than the lapis oil! I noticed my pimples shrinking within 12-24 hours which is amazing. If you use a pimple patch in conjunction with this treatment, all the better! I highly recommend it. It also works to prevent blemishes, but I don’t love using it as a facial oil, because of the scent. If you’re acne prone & can stomach strong scents, I’d say, go for it! For those with acne-prone, oily skin, you probably want to skip a facial oil. I suggest you don’t skip this section, however, because the facial oil I’m recommending pertains to your skin type too! Oily, combo, & dry types alike will get along with this one, due to vitamin a. Retinoids have been a skin saver for me and, to date, it’s the ingredient that does the most for my skin. If I’m breaking out, feeling congested, dealing with blackheads\dullness\pigmentation\dark circles\texture\etc, this is my GO-TO. It works way better for me than anything else, including vitamin c, chemical exfoliants, you name it! Although you can add vitamin c and exfoliants to it, and it will work even better IMO. It's important to give the skin a break when you're using multiple actives so it definitely depends on your tolerance level & experience. I'd say go slowly with retinoids & work your way up. Anyways, the facial oil that has become my go-to during menstruation is Pestle & Mortar’s Superstar oil! This is a facial oil & retinoid treatment all in one, which is a genius move because retinoic acid can sometimes be a bit drying. Because of that, I think oily skin will dig this facial oil, it’s much less greasy than others on the market, and it’s incredibly balancing to the skin. Superstar helps to nip breakouts in the bud before they even start! A total savior during my period. 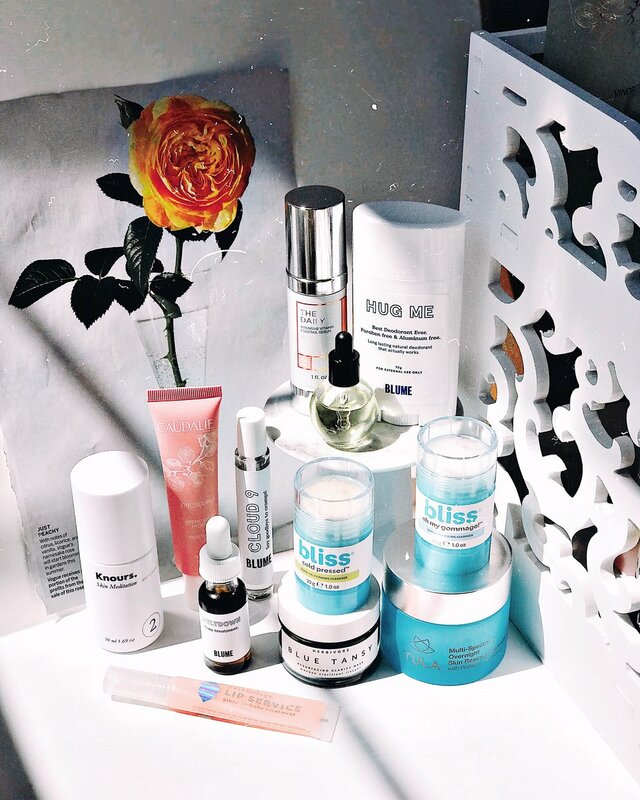 Is this the most effective retinoid treatment I've used? Absolutely not. But it makes a killer facial oil and helps keep my skin in tip top shape between tretinoin applications (THAT is the retinoid I'd recommend the most btw. Also known as retin-a. It's a miracle worker). So there are two different types of moisturizers I’d like to recommend. One for nighttime, and one for daytime. The daytime moisturizers are super light, perfect for oily or blemish prone skin, and probably too light for dry skin like mine. However if you pair them with the Superstar facial oil, they're amazingly moisturizing and will last all day! 1. Daytime moisturizer – Knours skin meditation gel-cream mixed with Caudalie’s vinosource sorbet! The combo of these two products is pure magic. Knours gel-cream is so light, it almost acts like a serum. It contains peppermint which is super soothing to the skin, and also anti-bacterial so the perfect moisturizer for acne-prone skin. This product doesn’t dry you out, but I still recommend combining it with the Vinosource sorbet. Another fluffy, light moisturizer but it’s a bit more protective than the Knours one. Together they are a match made in heaven, a gel-like, fluffy cream combo. 2. Nighttime moisturizer – Tula’s Overnight Skin Rescue Treatment. This is a retinol cream, exfoliating treatment, hydrating serum, and thick fluffy moisturizer all in one! I’m beyond impressed with the formula. It’s got glycolic & lactic acids to resurface the skin. SO many strains of probiotics to help brighten the skin tone, prevent breakouts, etc. Humectants like HA to draw water into the skin. Watermelon fruit extract, shea butter, yoghurt, etc to help heal the moisture barrier & soothe skin. And of course retinol, which is a powerhouse ingredient that does it all! Like most of tula’s products, this is an amazing value. Supergoop Unseen. This is one of my favorite spf’s though you can use any spf that’s over 30, as long as you reapply every 2-3 hours. Supergoop has a bunch of amazing formulas… I haven’t tried them all but they come highly recommended. The unseen one is my fav so far. It doesn’t leave a white cast at all, and blends beautifully into the skin. This DOES pill if you don’t wait for your previous skincare steps to dry first, but that’s true of almost every spf, since most of them have silicones. Dimethicone is the 2nd & 3rd ingredient here, so just be aware. That said I love that this is lightweight and has a matte finish. It doesn’t leave you looking greasy. If you hate the heavy layer that sunscreen often leaves on your face, you’ll love unseen. So my lips get EXTRA dry around my period… lately I’ve been using Patchology’s Lip Service because it addresses both dryness AND dehydration (SO rare to find when it comes to lip care, most formulas only deal with dryness). I like using this first and then following up with my Laneige lip mask. But for most people, patchology’s lip service is enough by itself! It tastes amazing, feels amazing, is super plumping (peppermint! ), and very very hydrating & moisturizing. I like to take extra good care of my body during my period because it’s also the time of the month that I’m most likely to break out around my legs & arms. Herbivore’s Coco Rose has been my lifesaver during these times. It doesn’t really do anything to prevent breakouts besides exfoliate, but it leaves my skin feeling baby soft smooth and definitely helps cellular turnover. If you’re breaking out on your limbs like I do, you can also use your Blume spot treatment oil! And of course, if you can afford to use a gentle chemical exfoliant, like Krave Beauty's Kale-lalu-yAHA, I highly recommend doing that instead. I usually recommend a physical exfoliant because they're so much cheaper but I definitely see more results from Kale-lalu-YAHA than anything else. Glycolic acid is my body care bff when it comes to dealing with pimples. So the product I'm talking about isn’t a body oil necessarily, but it can be used anywhere that you have hair. Fur’s signature oil is my go-to during the entire month, but especially around my period. Self acceptance is so important, and unfortunately periods have been demonized by society as being “gross” & “messy”. We women have to hide our cramps, pretend everything’s normal, and get on with our day. We don’t live in a society where women are taught to love and honor their bodies, but that needs to change. Fur oil’s product isn’t revolutionary (it’s an oil, like any other oil) but their message IS. This beautiful sensual bottle reminds me to slow down, breathe, center myself, honor my divine femininity, and be kind to the part of my body that’s in the most pain. Cramps or no cramps, your body deserves love. Be good to it, my friends! Blume’s Hug Me Deodorant is a fragrance-free option for sensitive noses. This is perfect for you if you don’t do well with essential oils. I happen to like essential oils, but I appreciate having a fragrance free option anyways! This deo also has probiotics which help to regulate bacteria balance & improve odor naturally. The only issue I see is this DOES have baking soda, so be aware of that. The scent of Hug Me is very light & powdery, basically it smells like straight up corn starch. It definitely improves my levels of sweat & odor, and is a safe option for my period when my nose is extra sensitive. Love it! I did experience a slight rash at first which was unfortunate but as long as I don't over-apply I'm usually ok. I always like having an option for period cramps, back pain, and the inevitable headaches that follow. My pain levels are already so bad (chronic illness related) so the last thing I need is MORE pain during menstruation. Thank goodness for Blume’s Cloud 9 roll on! This PMS oil is truly magic. It has clary sage, peppermint, lemon, geranium, etc in a base of jojoba oil. And it really works! Obviously this isn’t an alternative to morphine, but it DEFINITELY helps with mild aches & pains, and eases tension headaches. I love the roller bottle packaging, it makes it super easy to apply, especially to the forehead. Plus it’s only $18 which is a total steal IMO. Definitely on my repurchase list. This is probably my favorite Blume product to date! Bathing is an important ritual to me at any time of the month, but especially during my period. I find that my skin is extra dry when I’m menstruating, probably due to hormonal changes. Herbivore’s coconut milk bath is my saving grace. It has a minimal ingredient list, softens the skin, and makes my bathing experience 10x better. I like combining it with epsom salt, citric acid, & bath oils for a truly luxurious experience, but even by itself, it’s pretty awesome. Blume ALSO makes tampons which is amazing.They even have a biodegradable applicator option (choose the cardboard ones)! ALL of their tampons are made with 100% organic cotton and no fillers or fragrances, which is so rare! I have yet to find an organic tampon that’s actually affordable, but these are only $11 for 16 tampons. You can even build your own monthly box of these and get them at a slight discount. I'm definitely planning on repurchasing these. I might even sign up for one of their boxes or gift it to a friend! I think it would make a great gift.